Pacific Electric no. 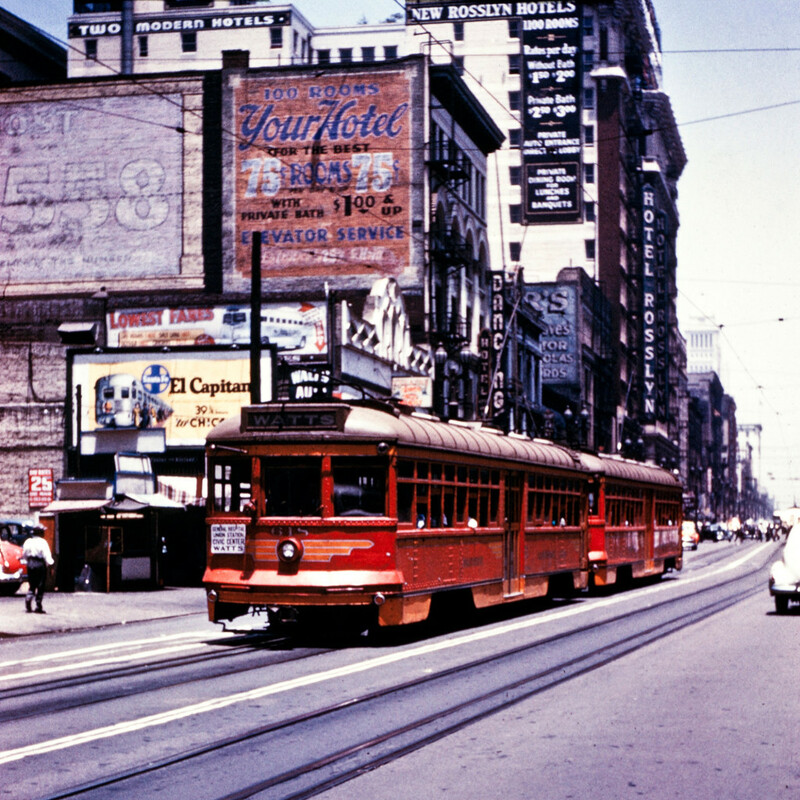 618 and another car are captured by Robert T. McVay on South Main Street near 7th Street. Note the Santa Fe advertisement behind the the car on the left. The image is undated. The Hotel Rosslyn is in the background at 5th and Main. Many of the building to the left of the scene have been replaced with a parking structure. Note that the ad for the Santa Fe EL Capitan is before the high level equipment. I’d say this puts this photo in the 1952 to 1955 time frame. According to Interurbans Special 28, 618 became 5131 in 1950, so this photo was probably taken in 1948 or 49. This would have been when trains going to Watts would have originated at Sierra Vista. I recall seeing a train of Hollywood cars on the Monrovia-Glendora line around 1950 with “Watts” on the headsign; this may have been a trial run to see how well these cars could cover the schedule on a more “interurban” line, although they were already in service to the San Fernando Valley by then. The Watts- Sierra Vista line ended service on Main Street Oct. 22, 1950 when Watts cars were routed into 6th and Main for arrivals and departures. Service to Sierra Vista was also routed into 6th and Main as a separate service. A franchise car operated daily on Main Street until Dec. 28, 1950 when PE service on Main ended forever. Question – on multiple car trains such as this, how did the conductor on the second car signal the motorman that it was okay to start once everyone was aboard or safely off? I know that on the LARY single cars with 2 man crews, the conductor would signal the motorman with a little “dink-dink” bell that it was clear to go. What did PE conductors do? Did they step outside and wave a highball to the motorman as a train conductor would do for the engineer? Just as a guess, I’d say there was a bell signal circuit that had a contact on the electrical portion of the MU couplers. I would also assume that the wooden cars had a signal circuit running through the MU cables. As I recall from the three-car Blimp operations at OERM, the rear car conductor gives two rings on the bell when the car is loaded, then the middle car conductor, and finally the lead car conductor. Bob, that is exactly the way it worked.